Модули PrestaShop Все модули созданы профессиональными разработчиками в соответствии с требованиями конкретной CMS PrestaShop. If you are managing a small business, there must be sometimes you wonder whether blogging merits the time and effort. The answer for it is YES! Blogging consistently is a simple, economical approach to upgrade your inbound marketing attempt, direct people to your webpage, and pull in more prospective clients. 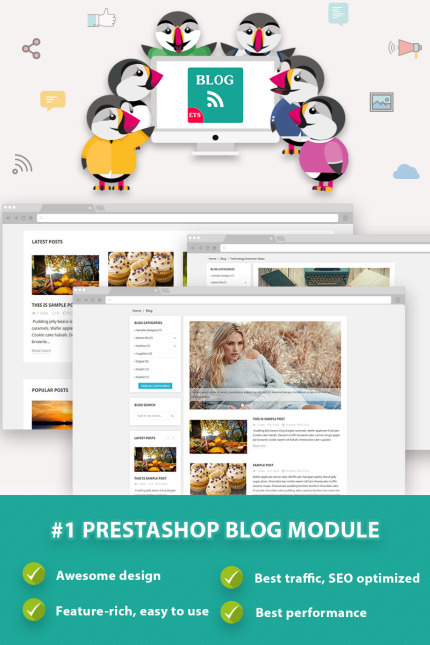 So let us introduce to you the best Prestashop blog module on the market - BLOG. This is a feature-rich, native blog engine that was specifically developed to seamlessly integrate into your online Prestashop store and improve your customer relation. It includes all general blog features: blog posts, blog categories, blog comments (with captcha protection), blog poll, image gallery, image slider, community author, related posts and related products display on blog page. This module is strongly compatible with different versions of Prestashop, custom themes and it is also guaranteed to work perfectly with other custom modules after integration. With BLOG, you can setup a group of customers to become blog authors and give them some certain privileges. 4 awesome blog page templates plus many more to come to make sure you have an eye-catching blog on your Prestashop online store. Unlimited colors with color picker so you can customize your blog to be suitable with current theme. BLOG is fully responsive. It can display smoothly on every screen size. Powerful comment system: Let your readers engage with your content. Leave reviews with stars and captcha image to make sure your blog comments are always real and not spam. BLOG also supports Facebook comment. Import/export content: export all your blog content (blog posts, blog categories, slider images, and photo gallery) in one click. BLOG also enables you to import data within a minute and transfer data from WordPress. Statistics: detailed chart helps you get an overview of blog post views/likes/comments. Views log and likes log with reader IP address and other information such as web browser, time, location. Easy to use backend: BLOG is completely done with jQuery Ajax technology to reduce the number of page reloads when working with the backend. Support multi-shop mode, multi-language and RTL languages. BLOG is designed and built to be an all-in-one package PrestaShop blog module. It contains everything you need to start a blog on your PrestaShop store and get more customers to your existing business. Make sure to contact us for help if you come across any issues when installing or integrating BLOG with your website. We are open to your questions regarding the use of this module and will be happy to provide solutions.